In this review, you can find out everything there is to know about Odor Eaters Antibacterial Foot and Sneaker Spray Powder. This product claims to prevent athlete’s foot as well as completely eliminate any unwanted smells caused by perspiration of the feet. Odor Eaters Antibacterial Foot and Sneaker Spray Powder eliminates odor immediately upon contact with the skin and does not leave any residue behind after it dries. If you want to learn more about the ingredients, pricing, and guarantee policy for Odor Eaters Antibacterial Foot and Sneaker Spray Powder keep on reading this review. The one active ingredient in this product called tolnaftate is a synthetic compound, designed specifically to eliminate fungal infections. It works on preventing fungal cell membranes from developing, by inhibiting the production of a key component of the process. While tolnaftate isn’t the most effective anti-fungal agent on the market for treating athlete’s foot (tinea pedis), it is the best substance against ringworm (tinea corporis) currently available. This type of spray uses a propellant to deliver the powder, however, such propellants typically tend to cause either skin irritation, other allergic reactions, or both. 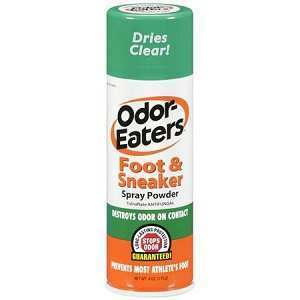 Odor Eaters Antibacterial Foot and Sneaker Spray Powder comes with a set of detailed instructions to help you use this product to its full effect. Wash the affected area carefully and thoroughly, then proceed to dry it. Once this is done, apply a thin layer of Odor Eaters Antibacterial Foot and Sneaker Spray Powder and massage it into the skin. This way the compound can eliminate fungal infections in the pores as well as on the surface of the skin. To treat an ongoing infection of athlete’s foot, apply the product twice a day, preferably every evening and morning. If the infection persists after four weeks of continuous use, or in the case of skin irritation, discontinue treatment and consult a doctor. Take note that Odor Eaters Antibacterial Foot and Sneaker Spray Powder should not be used on children under the age of two, due to their sensitive skin. As some of the ingredients are or contain allergens, applying this product may cause skin irritation, rashes, or other uncomfortable allergic reactions. The use of a propellant also increases the risk of skin irritation occurring. Pay extreme attention to keep the product away from your face, especially from your eyes. A package of four 4oz. bottles of Odor Eaters Antibacterial Foot and Sneaker Spray Powder costs $29.54, which includes shipping fees when purchased from Amazon. Due to the fact that the distribution of Odor Eaters Antibacterial Foot and Sneaker Spray Powder is not handled by the manufacturer, there is no universal guarantee policy. Rather, each re-seller enforces their own refund policies. Odor Eaters Antibacterial Foot and Sneaker Spray Powder is an effective product with a well-researched set of ingredients as well as clear instructions for use. However, the use of propellants and the lack of a guarantee policy causes this product to fall short. Jimmy Rodriguez	reviewed Odor Eaters Antibacterial Foot and Sneaker Spray Powder	on June 10th	 and gave it a rating of 2.5.